The common practice of talking about Quebec in terms of the "two solitudes" has led to the habit of giving its material history and, especially, its constructed landscape a binary interpretation. Between the architecture that is "French" and that considered to be "English," there is scant interest in the North American-ness, omnipresent all the same: the myth of New France or the "scientific" claim to cultural imperviousness have, in other words, reduced the built-up environment of Quebec to the "asceticized" symbol of a confrontation. 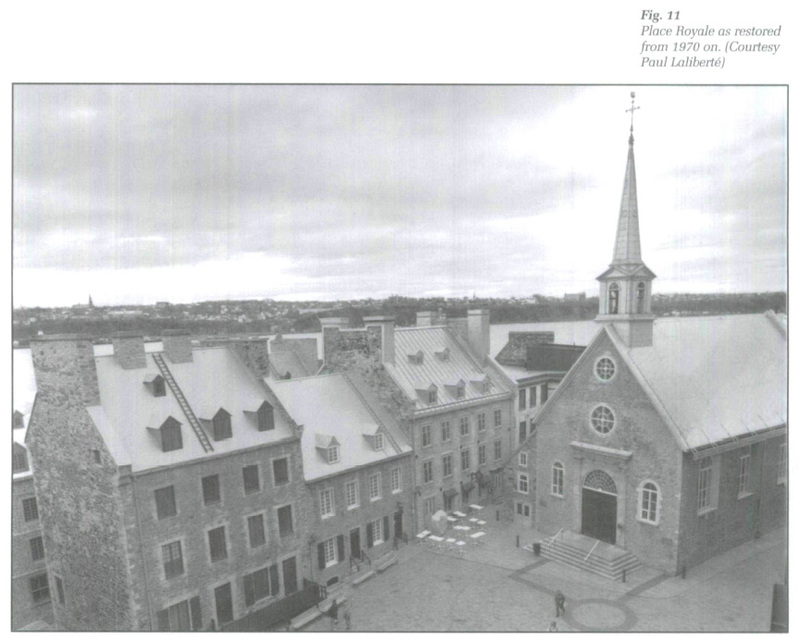 In contrast, this article approaches the landscape as the outcome of a hybridization, with Quebec as a territory of originality; the historical analysis of the morphogenesis and semiogenesis of the historic district of Old Quebec exemplifies the potential of this approach. Interpreting the superposition of cultures brings to light the birth of new characters and distinctive features that redeploy the problems beyond the unearthing of tracings of "original" cultures: the urban form, dwellings, and building techniques, seen as palimpsests, reveal instead a new, Québécois culture yet to be discovered. L'usage de raconter le Québec à l'enseigne du thème des « deux solitudes » a induit une habitude de lecture binaire de l'histoire matérielle et, tout particulièrement, du paysage construit. Entre l'architecture dite « française » et celle jugée « anglaise », tout juste s'intéresse-t-on à la nord-américanité, pourtant omniprésente ; mythe de la Nouvelle-France ou prétention « scientifique » à l'imperméabilité culturelle ont, en d'autres mots, réduit l'environnement bâti québécois au symbole « ascétisé » d'une confrontation. Cet article aborde plutôt le paysage comme résultat d'un métissage, qui aurait constitué le Québec comme territoire d'originalité ; l'analyse historique de la morphogénèse et de la sémiogénèse de l'arrondissement historique du Vieux-Québec exemplifie le potentiel de cette approche. Lire la superposition des cultures met au jour la naissance de caractères nouveaux et de particularités qui redéploient les problématiques au-delà du dépistage de calques de cultures dites « originelles » : forme urbaine, habitation, techniques de construction dévoilent plutôt, vues comme palimpsestes, une nouvelle culture, québécoise, qu'il reste à découvrir. 1 It is commonplace to relate the history of Canada in terms of the co-habitation, whether conflict-ridden or serene, of two cultures: "The French" and "The English" collided, as it were, in 1759, and afterwards evolved side by side, their respective cultures juxtaposed in this way for more than two hundred years — or so the story goes. The traditional understanding of the "Conquest" — "we lost the battle of the Plains," as some Quebec school children still tell the tale — serves to buttress this sort of reading of history: seen from this perspective, the occupation of the country by two different linguistic groups, the French and the English, would constitute the geographical transcription of the perpetual confrontation of these same two cultures; and from each of these cultures, it is possible, so they say, to distill a certain distinct character, an essence that has remained constant over time. 2 This is the common perception, expressed in a slightly caricatured form. It is true that more and more academics are taking the time to look at cultural transfers, at convergences, at spaces of contact (Turgeon et al, 1996; Fall and Simeoni, 1996); anthropologists and sociologists, such as Lévi-Strauss, have, for quite some time, allowed that cultural identity is far from impermeable. Still, many continue to discern the outline of New France, an imprint that the years have barely hidden, concealed in one or another modern guise (Ruel, 1995, 25-44). The historiography of the constructed landscape, as well as the practice of architectural conservation, provide numerous examples of these sorts of segregationalist postulates, visions of history that have inevitably led to rash interpretations and problematical reconstructions of a "myth of New France," a construct to which we have already made reference (among others, Noppen, 1989, 23-26; Noppen and Morisset, 1996,19-36). 3 It is, of course, quite possible (and quite natural) to continually re-write past episodes, to re-examine social imprints in order to provide explanations for them according to changing ideological positions; however, the very material nature of objects and of the constructed landscape invite us to attempt another sort of re-reading. In moving beyond a reductionist discourse that exposes a desire to form the constructed landscape through a single metalanguage reflecting the building of an identity based on politics more than fact, those with a critical perspective will henceforth highlight the British contribution and presence as it is reflected in the supposedly French-Canadian architectural environment (Noppen, 1995, 79-93; Noppen and Morisset, 1995, 55-67). The fact is that if we leave aside linguistic principles and a few other fetishes (Robin, 1994, 216-239), the contemporary material landscape of the province of Quebec shows very little allegiance to France: practically all Quebeckers spurn the sculpture "Colosse de Québec" (Colossus of Quebec), the handiwork of French artist Jean-Pierre Raynaud, located in Place de Paris (Quebec City); the Olympic Stadium, the creation of French architect Roger Taillibert (Montreal); not to mention architectural works of formal expressionism in cement à la Le Corbusier. Although it has already been done more than once, it is therefore hardly accurate to invoke Old Quebec, the site of the founding of New France, as a prime example of the "French" landscape in North America. Even so, one must not be led to believe — this would be based on the same discredited logic — that the constructed landscape of Old Quebec became irredeemably British after the Conquest either. The unique, specific nature of this place, upon which both visitors and residents agree, is, rather, the product of a process of overlay, of the gradual creation of a palimpsest that has left intact neither one nor the other of the cultures, those so-called "two solitudes" that are commonly seen as juxtaposed. Our intention here is to take the history of the palimpsest as an example of a new way of looking at the past, an approach that may serve to unveil the true originality of Old Quebec as a product of a diachronic sharing of the territory from the time of the French and British settlements to the present day. 4 Of course, it would, no doubt, be possible to retrace the image of the "two solitudes" by comparing the imprint of some township, the product of British colonization, with the less geometrical shape of a more venerable "seigneurie" in order to make the distinct characters of the two habitats stand out for all to see; in the same way, we can find architectural traces of the French Regime, for example, in a certain number of the convents and monasteries that have evolved on the margins of the landscapes that have been forged over the past three hundred or so years. However, those in quest of two architectural solitudes will have to face all sorts of obstacles. On the one hand, it must be noted that so-called "historical" landscapes are no longer necessarily inhabited by the descendants of their founders; over the course of time every space of New France has been subject to appropriation by successive waves of new occupants. On the other, the structuring of inhabited space, and the ensuing construction of various forms of architectural landscapes, are not immune to the forces of a certain geographical determinism, of agenius loci, or spirit of place, which transcends the limits of narrow cultural specificities. Thus even a Scot, an unwavering fan of stone, will build a house of wood in a region without a quarry! 5 Lastly, and above all, it is plain for all to see that the cultural divide that certain people are looking for is of minor importance when we consider the morphogenesis of the constructed landscape. Thus the working people's lodgings in Montreal's Pointe Sainte-Charles neighbourhood, just like the more up-scale houses of Westmount, are, beyond a shadow of a doubt, "culturally" North American, the specificities that make them distinct come from the hierarchies of economic conditions, nothing more, nothing less. 6 On the other hand, as we have already proposed, the exploration of the two solitudes theme opens up a much more fertile area of study when applied to an analysis of the constructed landscape; this approach, to a large extent, evaluates how the cohabitation (abstract) of two cultures in one territory is synthesized in a blending (concrete) of habits in the areas of urbanization and habitation. This pattern is, if anything, more apparent in the historical district of Old Quebec, traditionally seen by some as a monument to the "French fact," and by others, as living proof, as it were, of the British presence in North America; in reality, the specificity and inherent interest of the place seems to us to arise from the complexity and density of the palimpsest, made up of unique architectural syntheses that are meaningful representations of a number of particular contexts. 7 Old Quebec is laden with meaning — everybody agrees with this assessment, and thus the district has become an historical site — and this venerable quarter is, in fact, a sort of jewel case containing an exceptional collection of invaluable clues (more often than not, unfortunately, understood in terms of a certain ideology) that have become meta-linguistic expressions of historical periods, individual places of refuge, and centres of combat. The constructed landscape of Old Quebec is, however, also interesting in itself for its having been documented by an exceptional collection of writings (trade deals, contracts, etc. ), themselves having emerged from the aforementioned levels of overlay. 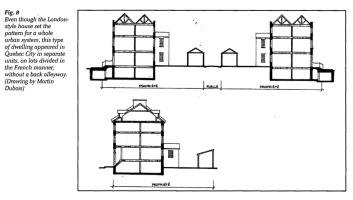 The French habit of keeping a written record of each act of building was actually adopted by the British establishment, even though the British were normally little inclined to write things down; and the whole collection of these documents, papers and buildings survived the ravages of time, sheltered, for example, from the Revolution that would have presided over their disappearance in France. Thus has a landscape of a rare historical depth lived on to tell a tale that proponents of the juxtaposed-cultures theory can only read in disconnected excerpts, as transcriptions that are exogeneous, imported here from elsewhere. 8 An historical analysis of the semio-genesis of Old Quebec will serve as a case-type: in response to modes of discourse that use the constructed landscape to confirm the grounding of one myth or another — in this case the architectural expression of a schematized culture — we suggest that the knowledge of two cultures might better serve the purposes, a posteriori, of the reading of the architecture itself, of the material configuration of die buildings, of their unique layout. Conceived, in this sense, as self-referential, the architectural artifact is liberated from the subjugation of one or the other of the two supposedly juxtaposed cultures, from being seen according to a perspective that is dictated by the style of the moment; in other words, by coming to understand the palimpsest that is Old Quebec, we are able, at one and the same time, to confirm the validity of our "blending" hypothesis and to promote the preservation of the district's true specificity. 9 The two cultures (French and British) that briefly crossed paths (and swords) at the time of the Conquest, were so different from one another that very few possibilities for exchange were open to them. The very way that they conceived of the documents they produced bears witness to this fact. Representations of the city, used today by some to better understand the material state of the city at a certain point in history, actually tell us more about the cultural universe of those who created them and, consequently, about the models of the city that they imposed successively upon the territory. 10 Quebec City, a place where these two very distinct identity-constructs are deeply rooted, was first seen and represented from the outside. The French lived in a universe of rigid conventions, and having a precise point of view upon the urban project thus appealed to them: the aristocratic city, for them, appeared, for example, divided into two very distinct entities, the upper and lower cities, since, between institutions and the bourgeoisie, the twain, according to the French, should never meet. 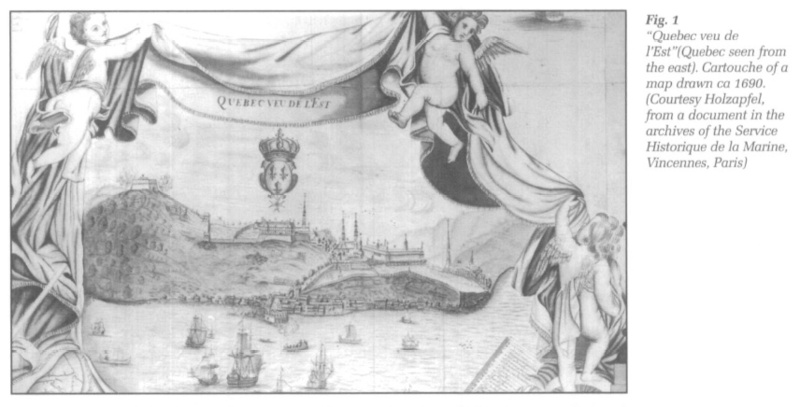 Official images, such as those produced for the king by the map-makers Franquelin and Fonville (Fig. 1) would obviously become the most celebrated sources of the myth of a New France in search of images that glorify mythic landscapes; rather than being transcriptions of reality, they are, rather, views guided by the dictates of reason, as everyone knows. The controlled perspective that they offer upon the urban project, seen as a sort of total work, disappears at the time of the Conquest. The documents produced by the British would, in fact, be of a whole other ilk. 11 Around 1760, an officer named Short became one of the first people to initiate this veritable turnaround. The picturesque views of the city that he passed on to us were sketched from within the city itself; some show buildings gutted by a conquest that he, of course, felt compelled to present in the best possible light; others reflect a discovery of its surrounding areas, as seen from various viewpoints provided by the city itself. The actual material nature of the city was immediately affected by this turnaround, this way of seeing the city from within the city; thus the gates of the city's fortifications, which had been decorated on the outside during the French Regime (a way of distinguishing the city, they served to announce the royal ascendance over the city to those on the outside), were henceforth decorated on the inside, displaying their colours to the urban world within, a realm over which civility, not regality, reigned. Fig. 1 "Quebec veu de l'Est" (Quebec seen from the east). Cartouche of a map drawn ca 1690. Fig. 2 From the beginning of the nineteenth century, the official image of Quebec City consists of a view from the inside. "View of Place d' Armes, Quebec, 1832." Chromolithograph by W. Walton and R. A. Sproule. Fig. 3 The Cathedral of the Holy Trinity within its "closes." 12 Everything took place at this time as if the whole city, that is, the conventional whole represented by the French, had been replaced by a material city, conceived as the sum of its parts; after having portrayed the site of Quebec City while awaiting its actual construction, the British then began to create representations of the monuments that they erected there (Fig. 2). The coming of photography only served to further sanction this style of representing objects. 13 Making up an integral part of this British city, these monuments also clearly stand out in urban space: a good example is provided by the Anglican Cathedral of the Holy Trinity (Fig. 3) erected in 1800. which is surrounded by "closes" just like its British models; other examples include the Séminaire de Québec and the Roman Catholic Cathédrale Notre-Dame, which are also separated from the surrounding urban space by their enclosures. It must be added that walls were also constructed to surround the latter two edifices in response to the political objective of limiting the Catholic presence within the city (Notre-Dame de Québec, like Notre-Dame de Paris, dominated the city square where its church square provided a vast public space); indeed, from that time onward, the dominant church would be the Church of England, not the church of France. But the British tendency to enclose space in this way also reflected a very different conception of urban space itself: the notion of the "king's city" would be replaced by the city as the "sum of its private domains," the ordering of which would henceforth govern both how Quebec City was represented in art and in material fact. 14 The very different ways that the British and French viewed property also had a great influence on the physical configuration of the city itself, and of each of its buildings. Thus buildings began to be constructed for purposes of profit and prosperity, for the economic value that the British accorded to architecture; they were not built to last, for posterity, as were their French counterparts. Whereas the French would forever have enlarged and improved the same group of buildings located on the same site (a few very old sets of convent buildings still bear witness to this process), the British, as part of their quest for the almighty dollar, reconstructed within the confines of the city itself and unceasingly transferred the process of improving and enhancing the value of urban space to fresh new land on its outskirts. This is what lies behind, for example, the construction of an expanded urban ring around Old Quebec, much like that of London, and also explains why within Old Quebec itself, where the British first settled, there was very little left of the French Regime from the nineteenth century onward. 15 It must be added that these conceptual differences that distinguished the French, who arrived on these shores at the beginning of the seventeenth century, from the British, who settled in Canada at the tail-end of the eighteenth century, were also a function of these respective eras. Over the span of the approximately two hundred years that separated the establishing of the first culture from the second, the conventional and rational values that marked seventeenth-century France gradually crumbled, to be replaced by the modernization of the economy, of political life and of the social and material environment that served to fuel the process of industrialization. Thus the British influence that made its presence known in Quebec City was experienced as a tidal wave. This is why it is only fitting to talk about overlay: the British culture did not co-exist with French culture on Canadian territory; it stamped itself on top of it. 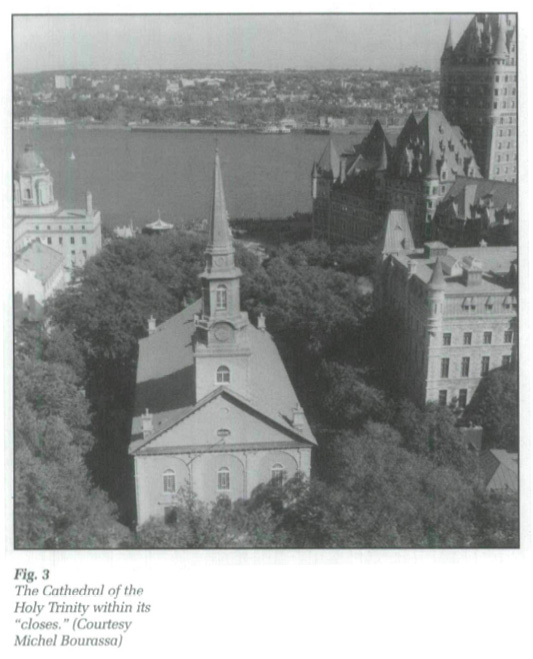 16 Rather than by a process of exchange, which would have led to a conscious preservation of the imprint of one of the two cultures, the specificity of Quebec architecture was actually engendered through a process of synthesis. 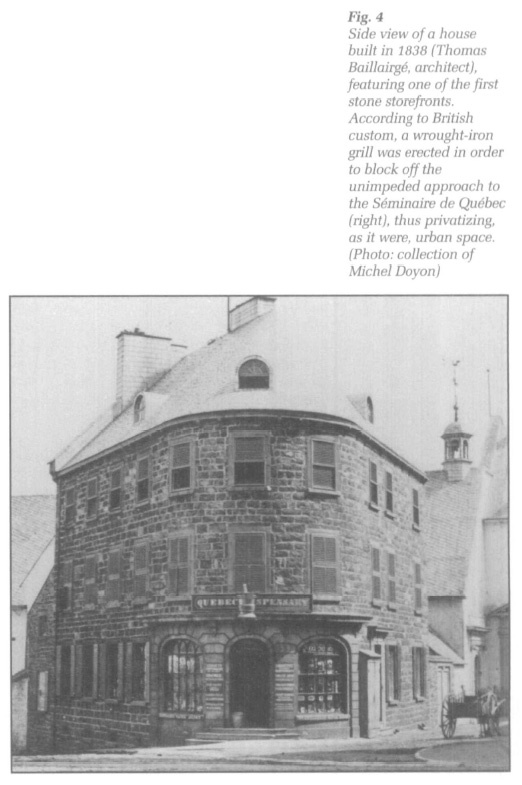 In this regard, we might cite the aforementioned confrontation of their respective property systems: the superimposing of the enclosure (or "closes") "principle" upon French urban space, in fact, created a particular element that is unique to Quebec City. 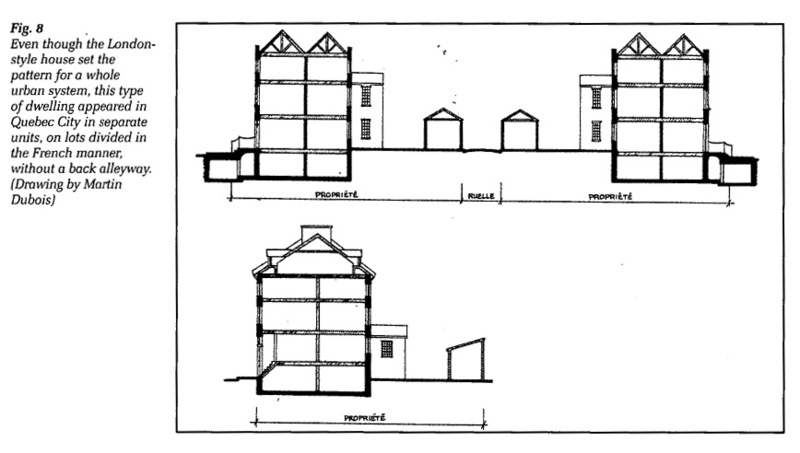 The outcome of this process was the closing of the fluid public space characteristic of the French city: the streets that provided access to groupings of convents, these access roads having also served as the public squares of the French Regime, became private spaces in this way (Fig. 4). 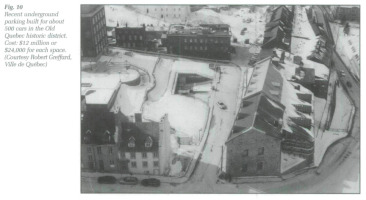 Thus, visually speaking, these buildings no longer belonged to the architectural arrangement from which, henceforth, they were made to stand out: Port-Dauphin Street, the former entrance to the episcopal palace, the small Ursulines' mew, and many others can be numbered among these public/private places that characterize the urban space of contemporary Old Quebec. 17 In a similar way, the recurring pattern of the city as a total work, which opened the door to representations of whole sets of figures so dear to the hearts of the French, and to the conception of new cities well-known in France itself, was obliterated, as mentioned earlier, by the functional city engendered by the British occupation. Now this functional city naturally had to be divided into as many districts or sectors as there were functions for them, and to spread out as these sectors multiplied, this as opposed to the French city that would have become, as it were, more vertically dense, superimposing functions one on top of the other. 18 Located around an institutional centre, the new districts, whose property values skyrocketed, were reserved for housing by the end of the eighteenth century; the outlying suburb served as a place for outings, for renewing contact with nature, a fervent need felt by the British, given the effects of industrialization. Within the wintery world of nature that they were discovering at their leisure, and while inventing the sort of iconography established by Heriot, Krieghoff, et al, the British introduced the type of villa that Italian Renaissance models had passed on to English settlements in warmer climes. Over the course of the nineteenth century, the first hybrid, transforming itself into the "decorated cottage" (a picturesque version of the classic villa), would soon rub shoulders with a second, the "rustic cottage:" this was based on the model of the peasant (or "habitant") dwelling, adapted to the rigours of the climate but necessarily inherited from the French Regime, that the British quite simply arranged as a new architectural model. 19 These houses, built by urban dwellers in the country, served to establish the process of urbanization, Anglo-Saxon style: urban sprawl became the dominant trait of the cityscape, which in the past had been demarcated by the fortified city walls. By the end of the nineteenth century, Quebec City and its outlying districts took over in this way the space that today comprises the Quebec Urban Community. The pattern of functional segregation of the Anglo-Saxon city was superimposed upon the French city, in the process not only enlarging its peripheral areas, but also transforming its city centre; indeed, it is thanks to this typical process of expansion that the former city centre, Old Quebec, actually survived. The French city would have undergone a perpetual face-lift, a modernizing of its multi-functional space; the process of urbanization, British-style, created single-function districts, especially of the residential variety, whose low population density was offset by the possibility of expansion towards the periphery. Urban expansion of the British variety is definitely the most important factor that ensured the survival of the historical monument that is Old Quebec. Fig. 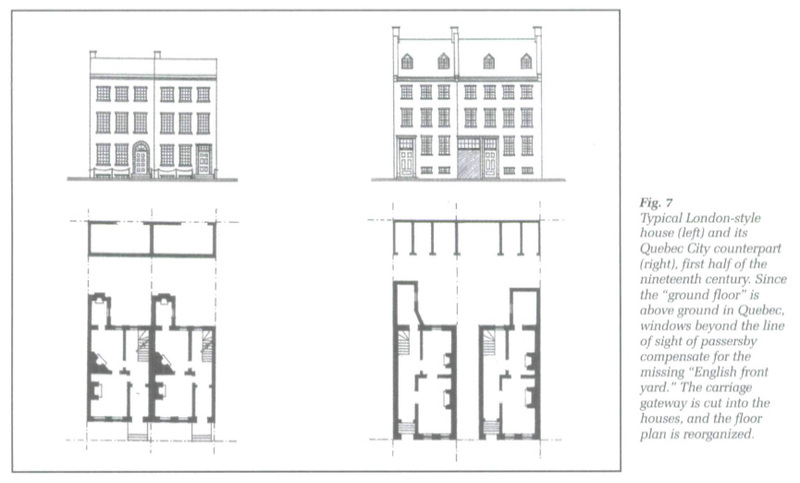 4 Side view of a house built in 1838 (Thomas Baillairgé, architect), featuring one of the first stone storefronts. According to British custom, a wrought-iron grill was erected in order to block off the unimpeded approach to the Séminaire de Québec (right), thus privatizing, as it were, urban space. Fig. 5 House located at 89, rue D'Auteuil, built in 1819. 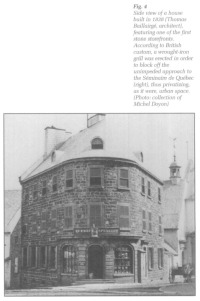 One of the first "Georgian" houses in Quebec City, built for a Scottish merchant. 20 The commercial sectors were thus distinguished from the residential and institutional sectors: ports, markets and factories all proliferated in a way that was unheard of until then. At the same time, the British established an economy based on trading in goods as a function of foreseeable consumption. From that point onward, markets were designed to sell local merchandise (fresh products, in bulk) whereas in the former city centre, a new type of building now housed the selling of manufactured and imported objects: the store. A street would be defined as a commercial artery if it provided access to such stores; rather than forming a true sector, since tradespeople naturally tend to set up shop along a route linking one marketplace to another, this route constituted a main thoroughfare, which, linking the lower-city market to the Saint-Jean district via the upper-city market, cut across the venerable former centre of this brand-new function. 21 The removal of markets to areas outside the city, especially the market that had previously been established in front of Cathédrale Notre-Dame, thus served to pass on to posterity, like an imprint of the past, this very curious commercial thoroughfare made up of Côte-dela Montagne, Buade Street, Côte-de-la-Fabrique and Saint-Jean Street. 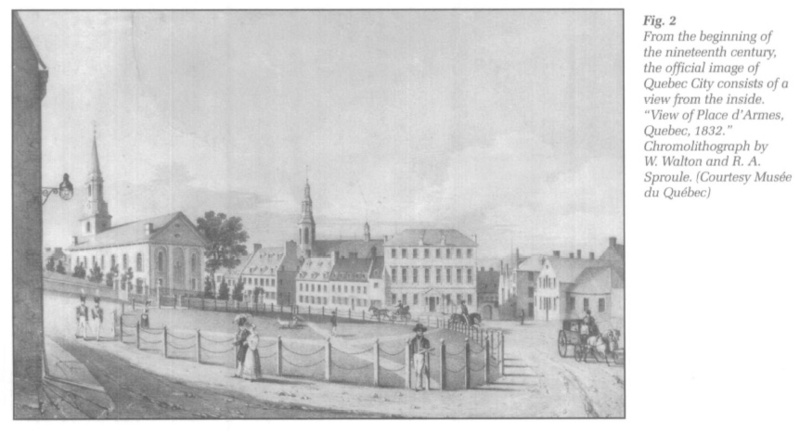 22 The typical Anglicized Quebec City resident developed the habit of residing on streets other than the commercial thoroughfares that the British settlement established. Also, the very typical storefronts, often cut right into even older buildings, were preserved, thus constituting a collection of façades of a unique diversity; whereas the modernization of a true commercial sector would have led to their being replaced, and the abandoning of a store in a Mediterranean city would have resulted in the building reverting to its primary residential function, nineteenth-century stores have in fact lived on in Old Quebec, for want of residents who might otherwise reinvest in the former commercial axis. 23 Indeed, as the nineteenth century came to an end, there was none of the typical increase in population density usually noted along a typical commercial thoroughfare: "modernity" was claiming larger and larger sectors for its own purposes, and at this point the Saint-Roch district, in the lower city, became the new city centre. 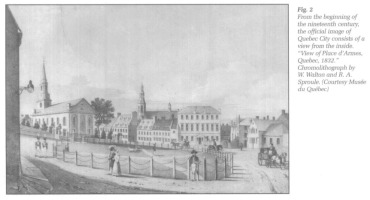 Thus a new sort of confusion, arising out of the existence of two city centres, was born from the fusion of French and British cultures, a confusion particular to Quebec City: for its part, Old Quebec, defined in terms of the French settlement, is today mainly characterized by its Victorian suburban buildings and has, in truth, only regained its "downtown" title thanks to the myth of New France and the establishment of a "Latin Quarter;" moreover, it has only done so at the expense of the North-American-style downtown of the lower city. 24 The process of constructing the streets of Old Quebec began at the dawn of the nineteenth century in such a way as to satisfy the typical British predilection for living in single-family dwellings. This art of living "English-style," to which the British had been accustomed for more than a century, collided here with the Mediterranean conception, a more venerable one at that, of collective life. Housing units such as "maisons bourgeoises" (tenement houses or buildings with several housing units or "appartements"), which the British discovered in Quebec City, seemed to English eyes breeding grounds for an intolerable promiscuity; so they wasted no time in establishing new lodgings, first of all within traditional structures, where a new interior design made them fit for single-family living. 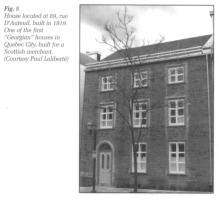 Then, from 1815 to 1820, a number of "Georgian" or "London" style houses appeared, dwellings that had inherited a more recognizable form, their style speaking volumes about the impulse to introduce a system of terraced houses to Quebec City urban life, a speculative formula that was at the origin of the British city of the classical era. 25 In Old Quebec such streets as Sainte-Angèle, Saint-Stanislas, Sainte-Ursule, D'Auteuil, des Grisons, Mont-Carmel, and Brébeuf, as well as avenues Sainte-Geneviève and Saint-Denis, are lined with single-family dwellings erected between 1790 and 1850 (Fig. 5). These streets, everyone agrees, give Old Quebec its unified character, creating the homogeneity of what has been dubbed the "classical city." The latter is modelled upon the structure of a London residential suburb. 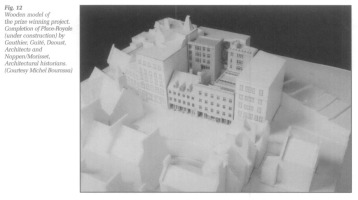 The Westminster, Mayfair and Victoria districts surrounding the Merchant City, as well as Edinburgh's New Town, provide the prototype for the sort of habitat that would renew me image of the former French capital, while reflecting the low-density residential vocation still characteristic of Old Quebec. Fig. 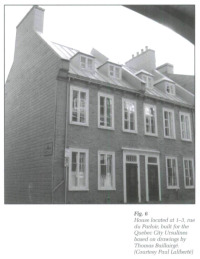 6 House located at 1-3, rue du Parloir, built for the Quebec City Ursulines based on drawings by Thomas Baillairgé. Fig. 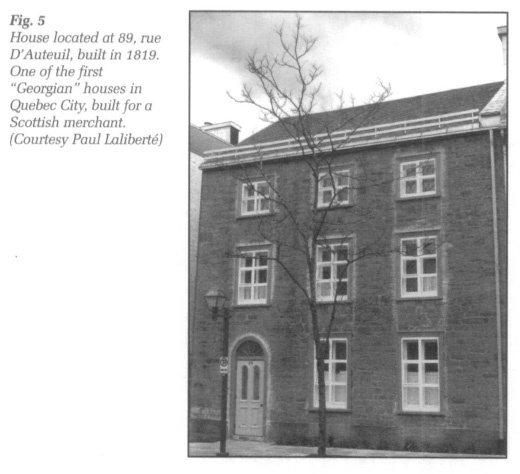 7 Typical London-style house (left) and its Quebec City counterpart (right), first half of the nineteenth century. Since the "ground floor" is above ground in Quebec, windows beyond the line of sight of passersby compensate for the missing "English front yard. " The carriage gateway is cut into the houses, and the floor plan is reorganized. Fig. 8 Even though the London-style house set the pattern for a whole urban system, this type of dwelling appeared in Quebec City in separate units, on lots divided in the French manner, without a back alleyway. 26 However, these British models, which provide for three-story urban houses, collided with the typical Quebec style, dating back to the French Regime, of two-story dwellings. In the minds of Quebec residents, who gladly adopted the single-family style, the three-story house acquired, from that time onward, the more limited connotation of an apartment house; furthermore, both Francophone worthies and religious communities placed orders with professionals, such as Thomas Baillairgé, for two-storied "London-style" houses that met the criteria of French classicism (Fig. 6). 27 Next, it is important to realize, above all, that these British dwellings were built on lots of land divided in a way that was totally foreign to their Anglophone occupants, this system of land division having been established during the French Regime. The British, who would, for instance, have been owners of horse-drawn buggies, of which the French (from France) would have remained renters only, were used to having back-door access to the lots upon which they lived, lots skirted by back alleys; Quebec City residents would thus build their stables behind their homes. However, the French land-division system made no provisions whatsoever for any such alleyways; and those London-style homes that took up entire lots left no room for access to a back courtyard. In order to deal with this problem, those carriage gateways that still today grace typical Old Quebec dwellings were cut into the façades of these residences (Figs. 7 and 8). 28 In the same way, the difficult adjustment that had to be made, as it were, by the typical London-style home to the French division of land led to this dwelling being "pushed" forward to the very edge of the street, whereas its British protoype provided for its having an English-style "front yard," a border between house and street that disengages the (occupied) basement crossed by an arched-culvert staircase. Given that the typical French lot did not extend far enough back to provide for such a space, the staircase providing access to a raised main floor had to be pushed to the interior of the house, behind a portal extended upwards by a transom that allowed daylight to stream into this new form of vestibule. 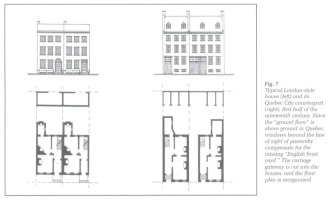 The elongated portals of Old Quebec, which are characteristic of classical prescriptions while rarely conforming entirely to them, are worthy heirs to this synthesis (Fig. 9). 29 Finally, the typical "Old Quebec house" acquired an outline that served to distinguish it even more by way of its roof form, which incorporated fire-resistant walls, a legacy of the regulations of the French Regime; these walls reflected an all-out effort to limit the spread of fires that might start in the neighbour's (inhabited) attic. London houses were not equipped with such a defense system, since their roofs, which were covered with slate or tiles, were also much flatter than those of Quebec City ever were. Fig. 9 The Old Quebec landscape is made up of portals, decorated in sculpted wood. The staircase, pushed into the house (to avoid occupying the sidewalk), creates a tall vestibule inside; to respect the arrangement of the façade, a very elongated door is created, aligned with the windows. 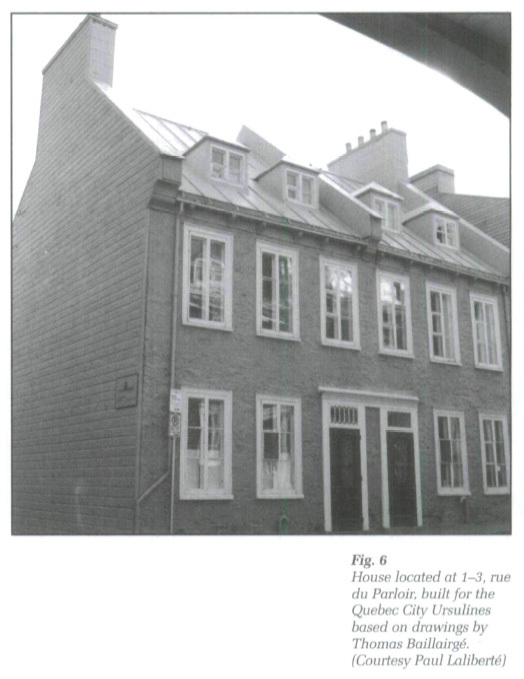 30 Traditional fire-resistant walls remained built-in features of Old Quebec houses since high roofs, inherited from the French Regime, continued to dominate the landscape for quite some time. Of course, the full attic of the classical French style came down to a slight extent; however, since the nearly flat roofs of the British classical style tended to collapse under the weight of snow, the houses of Old Quebec were topped by a roof of medium height, leaving enough space for attics that could be inhabited. As a matter of fact, the large French framework was not discarded, so that enough space was freed up on the top floor to accomodate new heating-stove systems installed by the British; the residents of Quebec City would then cut old-fashioned French capuchin-shaped dormer windows through the wall covering of their transformed London-style house, windows just like those mat allowed the light to enter the attics of French broken-topped roofs. 31 As the nineteenth century drew to a close, the Old Quebec house had thus become a whole new entity that was neither British nor French; a truly modern form, it should be pointed out, yet the bearer, in equal measure, of both of its parents' traits, this dwelling now constituted a unique synthesis of two architectural forebears. 32 The inherited "large French framework," which gave shape to the full attic (with its equilateral profile), dating from the French regime, a liveable space that was destined to be covered by slate, is by no means the only "symptom" of architectural overlay found on Canadian soil. A distinction could be made for quite some time between the "French" and "English" style attics introduced by British architecture, only because the former remained very useful indeed, as we have shown, as inhabitable spaces, a possibility for which British trusses, with their flatter profiles, which are lighter and more numerous (in order to support the exterior facing) did not allow. Construction techniques would thus move back and forth between one culture and the other, going through periods of experimentation, with builders and architects confronting the expertise of both cultures in search of generally synthetic solutions, suitable to the context and adapted to one another. 33 Hence François Baillairgé, back from a period of training in France at the beginning of the nineteenth century, proposed the addition of arches to the very British style of the first common jail in Quebec City (today known as Morrin College); these were typical elements of French architecture, but were unknown to English buildings. Still today, instead of the wooden ceilings, which otherwise would have characterized this building, basement arches are supported by the walls of the cells (rather than by the outside walls), thus protecting these spaces from the potential spread of fire, but stripped of the structural role they would originally have taken on in a French construction. Moreover, the disappearance of arches is indicative of the change that took place in the universe of construction practices. The French architect, you see, is traditionally a mason, skilled in stereotomy, steeped in knowledge of stone architecture; the British architect is more of a carpenter since brickwork, which dominates the architecture of Great Britain, does not require the particular competence required by a duly-constituted trade guild; it would have been impossible for a wood crafter to become an architect without a change in customs from the French to the English. 34 After the Conquest, it was thus the sculptors and the carpenters who, it would seem, took control over the city's construction sites. By this very fact, the province of Quebec was able to avoid the sorts of "custody battles" waged by architects who, in France, would claim "paternity" for certain interiors, in opposition to the professionals named above; but this peculiarity was also directly responsible for the curious situation, prevalent in Quebec, whereby interior decors, in churches, for example, are often richer, more ornate, and more carefully wrought, than the outsides of buildings. 35 Along the same lines, it might be noted that the British, who were used to brick buildings, brought brickworking techniques to this country along with the corresponding hardware, both of which would be "featured" through their being superimposed within the palimpsest. Thus did sash windows arrive on the scene, used by the first arrivals from Great Britain as a substitute for "French-style" shutters; the former were meant to open against the deeply recessed embrasure of a stone wall. 36 Be that as it may, this new arrangement was no more than a flash in the pan. Because of the complex framework that was required for them when installed in double windows, these sash windows were quickly discarded; Quebec City residents soon came to prefer shuttered windows that they had learned to transform into double windows as a means of staving off the rigours of winter. Having thus been reintroduced into the landscape, shuttered windows were no longer equipped with the cornice outlines of the casement windows typical of New France; instead, people chose the sash-window variety within a shuttered window frame. These windows are also bigger, a direct result of the demands of northern climatic conditions, as opposed to the reduced openings seen in France in response to a Mediterranean climate. 37 At the same time, Quebec-City residents found the accompanying doors and windows, those imported by the British, simpler to put together and to use. 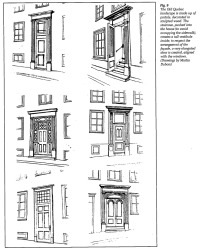 As a matter of fact, while French panelled doors and windows with a rebate open against the frame of the aperture, slotted as they are by a fillister, a groove on the surface of which all the small joinery hardware is fixed, British doors and windows open inside the frame; since all the hardware is hidden within the block of wood, these windows and doors are therefore thicker, the product of less fine and complicated woodworking and, hence, easier to put together. 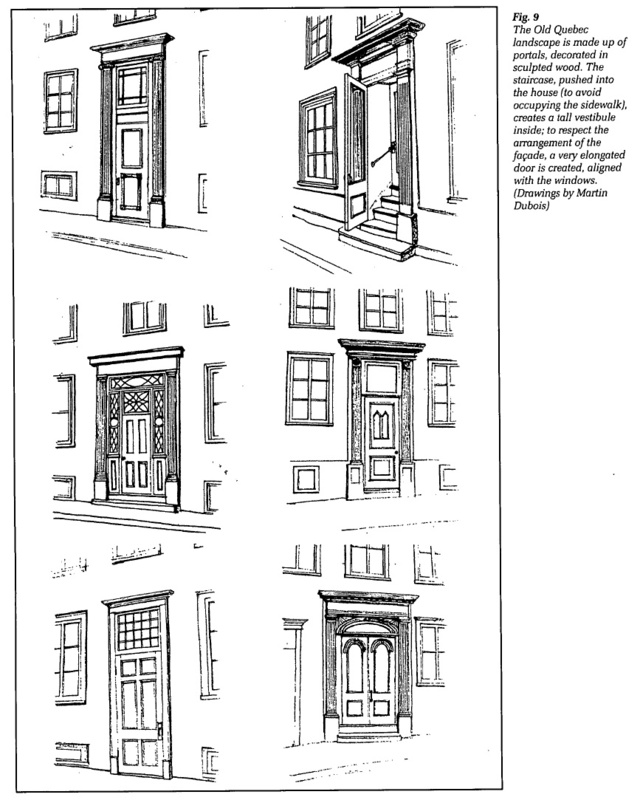 This, in the final analysis, is what has given Quebec City its "French" windows with their "English" thickness and with their decorations in English ironwork, windows which, moreover, have lost the transom formerly traced by casement windows. Neo-Cultures or a New Culture? 38 These are only a few examples of what makes up the palimpsest; everything in Old Quebec architecture could be considered from this perspective. The unique quality of the landscape, which is the result of such blendings, is patently obvious if one stops to consider the real configuration of objects, rather than attempting to see in them a confirmation of certain arrangements observed elsewhere. Leaving aside tendentious interpretations of it, and even above and beyond its actual physical make-up, which cannot realistically be associated with England or France, Quebec architecture in fact belongs to neither camp: it belongs to Quebec itself, as the morphogenesis of each of its elements so eloquently demonstrates. 39 No doubt this argument can also be applied to the entire cultural landscape of Quebec, a landscape that a school of latent historicicsm (in an attempt to forge a brand of nineteenth century nationalism) continues to describe in terms of the juxtaposition myth. Of course, post-Confederation Quebec had to choose between two neo-cultures, each seen as the product of a living heritage, each juxtaposed and barely in touch with the other; thus on this side of the Atlantic, the Quebec of the 1920s passed cultural protection laws à la française in order to preserve a New France whose very existence, in turn, justifies every manner of claim and demand, all of which sally forth under the banner of a sort of specificity. 40 It is true that above and beyond its actual concrete results, the rationalist approach to architectural restoration that Quebec adopted from that time onward has served to distinguish the province of today from its North American neighbours. From this angle, we are better able to understand why everyone in Quebec clamours for underground parking lots like those in France, as a measure of protecting and preserving the constructed landscape, whereas everyone else in North America, in the era of the automobile, is investing in aboveground multi-levelled parking lots. This is just one small example to show the workings of a sterile revivalism; in particular such misplaced nostalgia is responsible for the exorbitant cost of enterprises specializing in protecting and creating an old-fashioned milieu; and it must be said that the sort of cohabitation invoked by the myth of two cultures is clearly out of touch with reality. These are the elements that characterize the increasingly numerous contemporary reflections concerning identity and collective memory. 41 Having been initiated about forty years ago, the epic restoration/reconstruction of Place Royale (Quebec City), which is just now coming to an end, exemplifies this transformation of the cultural myth-making process. As a matter of fact, since 1960 people have been hard at work on this site, labouring mightily to conjure up Quebec's post-Confederation identity. First of all, the idea was to recreate "the cradle of New France" by replacing a set of buildings that, in the main, dated back to die late nineteenth century; this new creation, by its very presence at die centre of the "national" capital, would in turn testify to die undeniable "French character" of the Québécois nation. This concept of restoration was based upon the same set of premises as the legislation governing historical monuments, these latter rules and regulations having been copied from the French model in the 1920s. After having duly expropriated the site, the government presided over the restoration process that, indelibly marked by the legacy of the nationalist architect Viollet-le-Duc (France, 1817-1879), substituted the Québécois equivalent of Strasbourg's la Petite France for what was already there. There is no point in wasting one's breath inveighing against the champions of this quest for identity, nor fulminating about the predictable financial mishaps that befell this "historical monument," the offspring of French legislation parachuted into the economic context of North America. Fig. 10 Recent underground parking built for about 500 cars in the Old Quebec historic district. Cost: $12 million or $24,000 for each space. 42 Be that as it may, in 1997, with one façade of the "place" still to be completed, the door was opened to re-evaluating the potential contribution of the two solitudes myth to contemporary Quebec architecture. In fact, one could certainly find vestiges of the occupation of Quebec soil by France on the very site chosen for the future building of an interpretation centre (for Place-Royale); but archeologists and historians of architecture would also henceforth find themselves bearing witness to the British presence, as well as to the legacy of the nineteenth century itself, each having made a similar contribution to the spirit of the place. 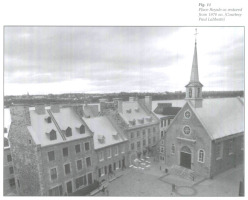 Here is a sure sign of the times: a national architectural ideas contest was launched, designed to solve what now appeared, at the dawning of the twenty-first century, to be a problem resulting from the very creation of Place Royale itself. 43 The prize-winning project, dubbed "the on-site restoration/insertion of the Hazeur/Smith houses," in fact draws upon this new resolve to look toward the future. By its very nature, any form of historicism would have been obliged to highlight only one era and, consequently, favour only one culture; on the other hand, instead of being a pastiche of one or another culture, the interpretation-centre project can be seen as an outgrowth of all these histories at the very moment when they become memories which, in turn, join forces in the contemporary world to form the collective heritage of each and every Quebecker. On the formal level, the project "communicates" very prudently, serving neither to extol nor criticize the past; in so doing, it constructs a sort of passage between, on one side, the authentic French and English monuments (of nearby Old Quebec), as well as those that have been reconstructed (in surrounding Place Royale), and, on the other, contemporary Quebec with its patently North American constructed landscape. 44 On a conceptual level, one could say that the thoroughly post-modern interpretation centre building forms the surface layer of the cultural palimpsest that lies beneath it: the very architecture itself becomes a means of interpreting, no longer offering limited versions of the past, but rather suggesting various interpretations that give life to an episode, a history, an identity. 45 In the "national capital," in metropolitan Montreal and elsewhere in the province, several new additions to the Quebec City palimpsest are, in a similar fashion, making it possible to leave behind, to a greater and greater extent, notions involving the integral restoration of mythic cultures, opening the door instead to an underlining of local features, themselves the products of the blendings that all these localities have inherited and which make them truly unique. The remodeling of the René-Lévesque and Dufferin-Montmorency boulevards at the edge of Old Quebec and of Place d'Youville in Old Montreal provide further examples of the growing pre-eminence given to the landscape as witness as opposed to the landscape as standard bearer, in other words, as the hoped-for reflection of an identity. Each time and in every locality where the spirit of place is allowed to take over from history, one is no longer forced to choose between two versions of the past in order to construct an identity; as is seen in the "concluding chapter" of the epic story of Place Royale, the two-solitudes concept itself becomes just one more element of the landscape, the stuff of memory made concrete in the palimpsest-space, there to be read, not to be conjured up. 46 Instead of first "believing," then (perhaps) "seeing" later, post-modern Quebec could actually learn to pass on more than just its own myths to posterity. Much more than merely representing a translation in object form of two neo-cultures, the constructed landscape of Quebec tells the story of a brand-new culture, a culture that can only gain by flowering within such a constructed milieu; one critical glance — a look more contemporary than romantic — should be enough to stop us from imagining confrontation once and for all. Then and only then will we be able to talk of our true distinction, our specificity. Fig. 11 Place Royale as restored from 1970 on. Fig. 12 Wooden model of the prize winning project. Completion of Place-Royale (under construction) by Gauthier, Guité, Daoust, Architects and Noppen/Morisset, Architectural historians. The author would like to thank Ann and Robert McBryde for the translation of this paper. This essay was written as part of the "Architecture, Identity and Urban Form" project subsidized by the FCAR Fund (Fonds pour la formation des chercheurs et l'aide à la recherche). Fall, Khadiyatoulah and Daniel Simeoni, eds. Les convergences culturelles dans les sociétés pluriethniques. Sainte-Foy: Presses de l'Université du Québec, 1996. Morisset, Lucie K. and Luc Noppen. "À la recherche d'identités: usages et propos du recyclage du passé dans l'architecture au Québec." Architecture, forme urbaine et identité collective, edited by Luc Noppen. Sillery and Sainte-Foy: Septentrion/CÉLAT (Université Laval), 1995. Les Nouveaux Cahiers du CÉLAT series, 12. Noppen, Luc. "L'image française du Vieux-Québec." Cap-aux-Diamants 2, 2 (1986): 13-17. —. "L'île-d'Orléans, mythe ou monument?" In Cap-aux-Diamants 5, 1 (1989): 23-26. —. "L'apport britannique à l'identité architecturale du Vieux-Québec." Présentations à la Société royale du Canada 48: 79-93. Noppen, Luc, and Lucie K. Morisset. La présence anglicane à Québec: Holy Trinity Cathedral. Sillery: Septentrion, 1995. —. "À la recherche d'une architecture pour la nation canadienne-française: entre le paysage et la patrie de la Crise à la Seconde Guerre mondiale." Cahiers d'histoire du Québec au XXe siècle 5: 19-36. Robin, Régine. "Défaire les identités fétiches." In La question identitaire au Canada francophone: récits, parcours, enjeux, hors-lieux, edited by Jocelyn Létourneau. Sainte-Foy: Les Presses de l'Université Laval/CÉFAN, 1994. Culture française d'Amérique series. Ruel, Jacinthe. "L'utilisation rhétorique de l'histoire dans l'arène publique: usages du passé dans les mémoires déposés devant la Commission Bélanger-Campeau (Québec, 1990)." Cahiers d'histoire du Québec au XXe siècle 3 (1995): 25--14. Turgeon, Laurier, Denys Delâge and Real Ouellet, eds. Transferts culturels et métissages: Amérique/Europe, XVIe-XXe siècle. Sainte-Foy: Les Presses de l'Université Laval, 1996.